Download the SmarterMail Free Edition to power your email communication. The SmarterMail Free Edition provides you with easy automation, migration and conversion of web services and forms the basis for collaboration. It lets you sent instant message through the mail server protocols by stopping spams, preventing security threats and works as a productive application. The specialties of SmarterMail Free Edition are listed in functional capabilities like mailbox migration, mail server conversion and compatibility with different control panels. It provides the ability to add, remove and edit domains, users, calendars, tasks, notes, RSS feeds. You can retrieve user and get performance statistics details. The SmarterMail Free Edition supports SyncML, Exchange ActiveSync, CalDAV, CardDAV, Exchange Web Services and Outlook Scheduling Assistant. It can synchronize with Microsoft Outlook 2007 and higher, Thunderbird and Lightning. 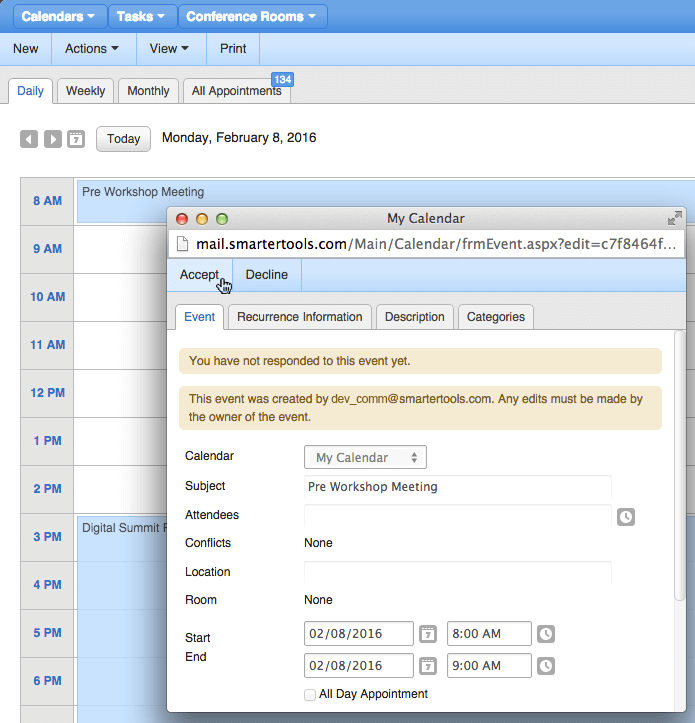 It has webmail’s reminder system, availability of attendees, personal contacts, shared calendars, contacts, tasks and notes. Send instant message using the SmartMail Free Edition server and search for your chats from the archive, take print. It is compatible with the chat clients on XMPP. SMTP, IMAP, IMAP IDLE, POP3 and LDAP – all such server protocols are supported by SmarterMail Free Edition. The tool has so many functional capabilities to mention like gateways greylisting, spam check, domain exception, authentication, SSL/TLS support, backup MX server and SmartHost. Use SmarterMail Free Edition to throttle email list, to prioritize your emailing, to assign per subscriber mail login, for customization of command messages, for composing enhanced emails and to toggle auto generated responses. The tool also have common subscribers database, links unsubscription, double opt-in and automated bounce detection and removal. It supports smart phone connectivity and multiple identity support with contacts import and export abilities. What do you think about SmarterMail Free Edition? SmarterMail Free Edition 16.3 B7040 Feb 20, 2019 There are several important release notes to be aware of before upgrading to this version. SmarterMail Free Edition 16.3 B6985 Feb 20, 2019 Changed: All autodiscover options are enabled by default for new domains.